Few American flags capture the essence of the Civil War like this 35 star homemade flag, made in 1863 along the Ohio-West Virginia border to celebrate West Virginia statehood. West Virginia was born amidst the conflict of the Civil War when the northwestern counties of Virginia voted to secede from the confederacy and form a new state for the Union. This flag was flown from the Olive Green General Store in Olive Green, Ohio, a town which no longer exists. The flag, created by the Ohioans to boldly welcome their West Virginia countrymen back to the Union, stands as a testament to the tensions stirred by West Virginia's secession. According to family lore (and apparent upon close visual inspection), the three holes to the right-center of the flag are bullet holes shot through the flag by dissenting southern sympathizers as it hung on the general store. The flag itself is a masterpiece of American folk art. It exhibits several extremely rare characteristics seldom found on American flags of any era. The entire flag is constructed of a sheet of thick cotton cloth onto which the blue canton and red stripes are hand sewn. The practice of sewing a cut-through canton and red stripes onto a solid white sheet is known as "reverse appliqué". It is extremely rare and almost never seen on American flags of any era. Amazingly, both sides of the flag have their own sewn stripes and cut through canton, with the same incredible pattern of stars. The blue fabric used for the canton is actually a calico print fabric, rather than a traditional solid blue. The use of pattern printed fabric on any American flag is also extremely rare, and almost never seen. Perhaps ten or fewer flags that I know of contain fabric of a calico or other stylized print. Interestingly, both ends of the flag feature a rope-in-sleeve hoist, yet another rare trait. This is further evidence that it was made to hang, anchored on both sides, from the front of the general store. Yet another rare trait is the fact that the canton rests on a red stripe, commonly known as the "blood stripe". Although not always the case, tradition is that this trait is found on flags made during wartime to symbolize the nation at war, and in this case it clearly holds true. 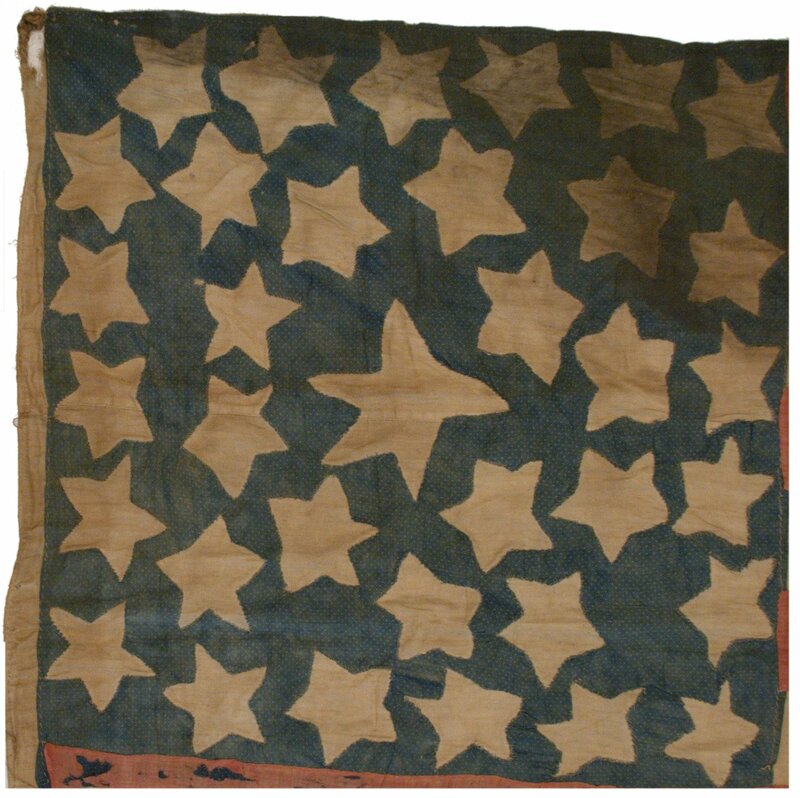 Finally, the extraordinarily whimsical shape of the stars, arranged in a jostling pseudo-medallion, results in one of the most visually interesting and unique cantons found on an American flag. The soot at the top of the flag indicate that the flag was probably flown or hung near a chimney or wood burning stove. Unlike the elongated tears toward the fly end of the flag, the three holes in the center of the flag were clearly caused by the traumatic impact of a bullet, not merely a tear. The flag is remarkably intact for a cotton flag that is nearly 150 years old. It descended more than 140 years in its original family and remains today an early American treasure--at once a testament to both the strife of the Civil War and the perseverance of the American spirit.